My first experience of Springbank was a few years ago when I bought at the same time the 10, the Longrow CV and the Hazelburn. The three had an herbal note that change from to the other passing from being lemongrass to sourish herbs to rotten long grass. Everything else, I like about Springbank except for that rotten grass. So you will understantd that it took me a few years before I had the will to go back to Springbank. I didn't miss my shot when I bought the CS 12 yo. So it is with this renewed optimism that I am having a pour of the Green 13 yo. The Green 13 yo has been released in 2015. It is made of organic barley and it has been fully matured in sherry cask and bottled at 46% ABV. The reviewed bottle has been opened for 10 days and it is my third dram out of it. Nose: First the sherry cask is showing itself for a fraction of a second, then I have cereal, a light malt with a little bit of dried peach, vanilla, salt,citrus and some cool mint (maybe some Aloes) in the background. At this moment, it is very clean and you only have the idea of the Springbank grass floating in the air. After I left my glass unattended for 20 minutes, you have another story. It is now a real Springbank with the grass more in front. The malt is heavier and so is the salt. I also have some petroleum from time to time and the sherry cask play a bigger role than before but stay discreet. Palate: On the palate, the sherry cask is way more present.It is a nice sherry but not well defined (keep in mind that the bottled has been opened for only 10 days) except for some orange peel. The malt takes is place with some weight and there's some chili. There is more sweetness than on the nose. All the other notes from the nose are their but in traces. Water brings back the cereal leaves a bit of room for the fruits but weakened the palate in general and the malt in particular. Finish: The non defined sherry stays with you with a general coolness and an slight impression of alcohol. It is Ok but nothing more. Conclusion: The nose is very interesting and the sherry cask play very little role in it. There is nothing wrong about the palate except this lack of definition, which is why there is nothing great either about this palate. I think the general coolness comes in part from the alcohol and is masking the true character of this dram. I am hoping that with time it will improve. The malt with this little note of dried peach makes me think of a light version of Glengoyne and shoudn't be mask by anything. The petroleum note that I had on the nose is one I usually get with Longrow and it would be a nice complement to the palate. That is why I would really like to taste a Longrow from 2015 but they are hard to get around here. @Robert99, I bet that this expression will transform a bit with time. The alcohol bit is likely to settle down and I would be interested in what think of this bottle a third of the way through in 4-6 months. Maybe refill sherry, with the distillate that would make sense? Except for Ralfy who is a Springbank fanboi convinced they can do no wrong, most of the reviews are luke warm for this one. I passed and I'm sticking with the cheaper and better (IMO) 10 year old. But let us know what you think after it's had some open bottle time. Thanks for the excellent review @Robert99. @NAV26, @BlueNote I do think this one will improve with time and I will update my impression of it in a few months. I bought at the same time the Hazelburn Rundlets and Kilderkins that is a bit better IMO but I don't expect it to improve. It will be fun to compare the two in something like two months. I opened my first 2 Springbanks in 2011, both 12 year, both CS, one claret wood. I didn't mind them but rarely went back after the first try. I did gas, but it wasn't till about a year or so later that I tried them again. Not sure if it was my palate ir the bottles, but they were fantastic. I have not been able to reproduce the experiment with the CS as my second bottle was finished too quickly. But I do have a Claret wood I opened in Collingwood last year and you've inspired me to give it a try in September when I have a chance. My Springbanks never last that long, but every account I've heard of a long-open bottle says they just keep getting better. @Nozinan The beginning of your post let me hope for a possible trade then you cut my hope to nothing in just a few words. That is hard! I hope you will enjoy the Claret again and let me know of your latest Chinese experiments, they are fun to read. I'm with @Ol_Jas on this one. Every Springbank that I have ever had has gotten better and better with more time and air spent in the bottle. Even with every pour, I force myself to have patience because I notice that they evolve and get better in the glass as time goes on. A, I can never resist jumping into some Springbank chatter. B, I'm the same poster as @Ol_Jas you responded to. (I recently changed my account to represent my whisky club.) Just FYI. D, I currently have an open bottle of Springbank 12 CS, and I'm planning to give it a long shelf life like I've never done before. I almost always polish off my Springbanks tout de suite. 'Bout time I give one a chance to really develop over time. 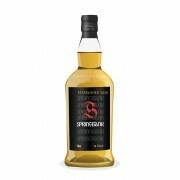 I promise that you won't regret nursing your bottle Springbank 12CS.